High energy all round over the past few days with the Netball Quad series being held at Copperbox Arena, London. 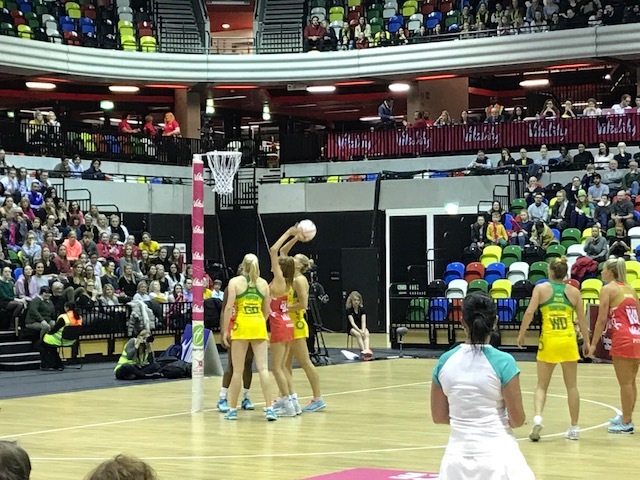 The England Roses fought hard to defend on their home territory triumphing over the New Zealand Ferns during extra-time, then narrowly being defeated by the World Champions, the Australian Diamonds. All teams showed finesse and tenacity, playing to the highest level on the DYNAMIK sports floor specially installed for the event. Craig Jack, Commercial Director of Dynamik Sport, received fantastic feedback from all the National Teams which praised the high performance and player comfort that the Dynamik Sprung Portable sports floor provides. England Netball have recently purchased this new Dynamik court which will be used for international matches as well as the World Cup in 2019. This floor is really something special and will be an asset to the sport of Netball for years to come. Dynamik Sports Floors are proud to sponsor the England Netball team and wish them every success with their last fixture in South Africa.